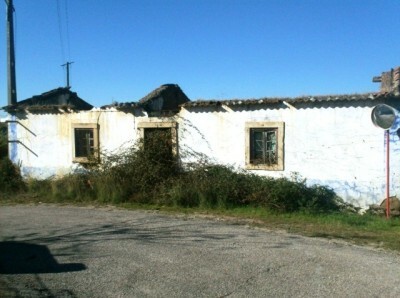 A ruined stone cottage in need of total reconstruction for sale near Tomar in central Portugal. The cottage, which is not connected to either mains water or electricity, is set on a plot of land measuring 1,840 square metres. The cottage is set back from a quiet, link road and has good open views over the countryside to Tomar. The cottage is in a bad state of repair and would require total reconstruction. The cottage has been constructed in stone, however many of the walls are now crumbling. The cottage has been originally constructed in a very traditional style over one storey with carved stone window and door surrounds. Although the property is not connected to mains water or electricity both of these public utilities are present on the boundary of the property. The cottage has land measuring 1,840 square metres, which is gently sloping. There is a wide variety of mature olive trees and several fruit trees. The property is detached and private, though there are neighbouring properties on the opposite hillside. The cottage is situated near the village of Sao Pedro and is within walking distance of several cafes and a restaurant. The historic town of Tomar, which is home to the UNESCO listed Knight Templars Convento do Cristo, is only six kilometres from Sao Pedro and has a choice of supermarkets, cafe bars, shops, builders merchants, architects, restaurants, hospital, train station, bus station and university. The closest airport is Lisbon, one and half hours’ in a car. Porto airport is approximately two hour car journey. Both airports are serviced by several low cost airlines, which operate regular flights into and out of the United Kingdom.